It is hard for me to read an 800+ page book and not feel obligated to give it more stars. Especially one that is written with so much research, love, and dedication as this book was obviously written with. But 2 stars is all I can muster. I was totally on board for the first 30% of this book, and then the author lost me. She did two things with Jamie (or had him do 2 things, rather) that I just could not get over and it honestly ruined the book for me, I couldn't feel like I really ever rallied behind him. It was tremendously hard for me to get past these two things - without giving too much away, he lies. Big ones, too. I'm so disappointed. Also, the book went off the RAILS with ridiculousness and stereotypes, OMFG, in certain events towards the end I wasn't even sure WTF I was reading or what was going on! In a way, I felt cheated, and I'm still trying to figure out completely why. Will I read book 4? Maybe. At some point. But I need a breather. 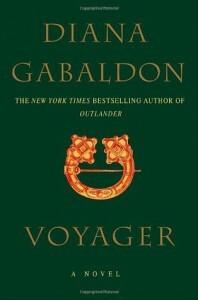 Everyone telling me VOYAGER was their favorite maybe built up my expectations, but I preferred the Jamie and Claire in [b:Outlander|10964|Outlander (Outlander, #1)|Diana Gabaldon|https://d.gr-assets.com/books/1402600310s/10964.jpg|2489796] and [b:Dragonfly in Amber|5364|Dragonfly in Amber (Outlander, #2)|Diana Gabaldon|https://d.gr-assets.com/books/1393788871s/5364.jpg|2866304] to the Jamie and Claire in Voyager. I'm still here blinking, wondering what I just read.